Gabriel Chernick is an award-winning composer, musical director, and jazz pianist from London. After studying Music at Cambridge University, and Composition for Film & Television at the National Film & Television School, he recently made his television debut with ITV in a pilot for a new gameshow, directing a live, 7-piece band performing entirely originally composed music. As a film composer, Gabriel has won a ‘Silver Award’ at the Global Music Awards for his soundtrack to David Elm’s silent short film ‘SWAG’, and scored the short film ‘Not Sophie’s Choice’, starring Catherine Tate and Alex Macqueen, which has so far been selected for 13 film festivals including the Hollywood Comedy Short Film Festival, LA Short Film Festival, Raindance Film Festival, Encounters Film Festival and The British Independent Film Festival. Many of his scores have featured on films selected for the Cannes Film Festival, including ’The Raisin’, which recently won Best Foreign Short at the LA Comedy Festival. He has also scored commercials for the BBC, and titles for series such as viral-comedian James Veitch’s ‘Veitch101’. 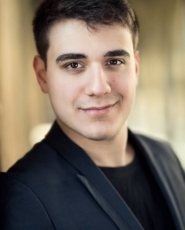 Gabriel has worked extensively as a musical director and composer in theatre. In his first theatre show at the Edinburgh Fringe, he won a ‘Special Commendation for Original Music’ at the NSDF Edinburgh Festival Awards, for his score to ‘Games of Love and Chance’. He then became composer and musical director for comedy duo ‘Goose’, which subsequently saw 3 years of sell-out runs at the Edinburgh Fringe, and performances at the Soho Theatre, Brighton Dome and Latitude Festival. For the last few years, Gabriel has also worked as musical director for ‘Denim’, a 5-piece drag group, who have performed with ‘Florence and the Machine’ at Glastonbury, headlined Port Eliot Festival, and recently completed a sell-out run at the Edinburgh Fringe Festival. This year, Gabriel was assistant musical director for ‘Amusical’, a musical-comedy show, featuring over 30 of the UK’s most successful comedians, including Sarah Pascoe, James Acaster, Nish Kumar and Ed Gamble. In January 2018, Gabriel begins work as musical director and arranger for the UK tour of a jazz adaptation of Mozart’s ‘Le Nozze di Figaro’, with the ‘Merry Opera’ company. Gabriel currently conducts three choirs based in London. ‘Il Dodici’, a 12-piece choral ensemble, have recently performed services and concerts at St Martin-in-the-Fields and Southwark Cathedral, and next year will sing at Westminster Abbey, Winchester Cathedral and on tour around Venice; the ‘Minim Singers’, a 16-piece, pluralist Jewish choir, have performed with BBC Radio 3’s Norman Lebrecht, and recently recorded their debut album with ‘Eastwood Records’; and ‘On That Note’, a 12-piece vocal performed this year at the Brandenburg Choral Festival of London.